Italian wine-bar where you can taste traditional Italian recipes and try the best olive oil in the World. Located at walking distance from Viktoriapark, Tirelli’s brings Central Italy, its tradition and products to Berlin. Sitting at Tirelli’s, the young wine bar in Kreuzbergstraβe, means to indulge yourself with a journey across the central Italian region of Tuscia, away from the city chaos. The place is little and cozy, the atmosphere relaxed as if you were having dinner with your friends, food and wine come directly from Central Italy and are well known and appreciated in the whole world. Read this article in Italian. «Since I opened Tirelli’s, more than one year ago, I have been trying to create a familiar and cozy place, where you can feel at home» says Marco, the owner. «Plates, glasses and cutlery come from my own place. The tables disposition changes depending on the situation and the number of guests expected. It’s a bit like welcoming friends at home: clients aren’t surprised when they see that cutlery pieces and plates are different one to another, they tend to pay more attention to the food quality, how it is cooked and the atmosphere. I like to chat with them and to provide them with information about the products I’m using: in this way I get to establish a good relationship with my clients. I like to tell them about the products we use in our kitchen, the wines we serve, my beloved Tuscia, the area located in the region of Lazio from where we get most of the products we use and sell at Tirelli’s». «Most of the wines we offer come from Tuscany, Umbria, Lazio and Marche: among them there are some internationally well known wines like Sangiovese or Chianti, but also some less popular ones, even among Italians. 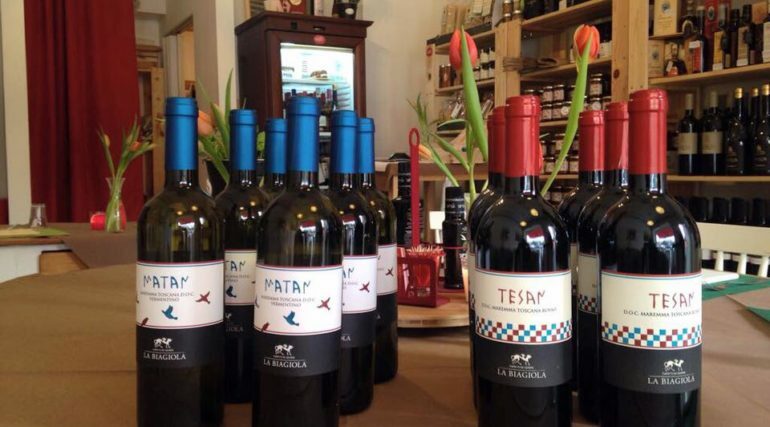 These wines come from little Italian producers: some of them are natural and bio, others are produced in little wine cellars with a very limited production. Most of the clients are curious to try wines like Sagrantino, which has become one of the most appreciated ones in our winery. Another product I am very proud of is the Tamia oil, an extra virgin organic oil produced in Vetralla, Tuscia. The Tamia oil has won severals international awards and the prize for the best bio mild olive oil in New York and Los Angeles. I am the only reseller of the Tamia oil in Germany and, on demand, I organise tasting and meeting events with the original producer». «Tirelli’s is constantly evolving. Not just the wines and products offer is changing, but also the dishes. I cook daily simple and genuine dishes depending on the availability and the freshness of the ingredients. It’s like buying groceries: the menu varies depending on what the suppliers are offering. I believe that sitting down to eat means gathering and relaxing: that’s why I always try to recreate a familiar and spontaneous atmosphere with my dishes. The menu varies daily, just like the Italian tradition requires: the sauces preparation, the dishes presentation and the ingredients selection make our specialties unique».